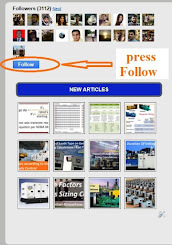 Today, we will explain The Main Components of PFC Panel and how to select each one of them. In the event of an over voltage, electrical stress on the capacitor dielectric and the current drawn by the capacitors will increase. The PFC equipment must be switched off in the event of over voltage with suitable over voltage relay. In the event of under voltage, electrical stress on the capacitor dielectric and the current drawn by the capacitors will decrease. This condition is not harmful. But protection is provided based on customer request to protect system from under voltage. Over current condition is very harmful to all current carrying components. All the switchgears are selected on a higher maximum current carrying capacity. However suitable over current relays with alarm can be used for over current protection. At the incomer level short circuit protection is provided by devices such as MCCB, ACB and SFU (switch fuse unit) suitably. At the step protection level, suitable fuses, MCB, MCCB can be used. It is taken care by thermal overload relay. The PFC controller must be tripped in cases where internal ambient temperature exceeds the limits. Reactors are also provided with thermal switches, to trip in the case of temperature increase. Two earthing points are provided in the PFC panel for connecting to the earth bus. This will ensure the overall safety of operating personnel and equipment protection in case of earth faults. It has to be connected at power incoming side of the panel, Earth leakage relay is provided to safeguard the operator by tripping the incomer. Capacitors require a minimum discharge time of approximately 60 seconds after they are switched off before they can be switched on again. This is to be set in the PFC controller. Capacitors are provided with discharge resistors. 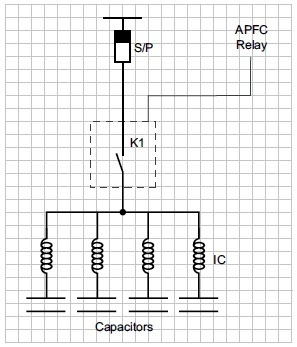 Solid State switching (Thyristor Switches) can be used when fast switching in APFC Panels is needed. It is used to disconnect the PFC panel in case of short circuit, over load and earth fault. The rating of the incomer protection device will vary depending on rating of the PFC equipment and the required fault level. 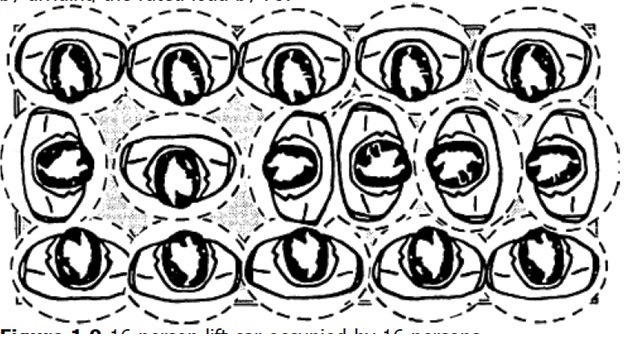 SDF, MCCB or ACB can be used as incomer protection device. The Outgoing protection devices is provided to protect the individual capacitor step in the PFC equipment. The outgoing protection may be HRC fuses, circuit breakers (MCB, MCCB) & SDF (switch disconnector fuse) depending on the rating of the individual capacitor steps, required fault level & customer requirement too. Note: Use switching and protection devices designed for capacitor switching duty. We will explain in below how to choose the protection device in each case. See Fig.1. Be coordinated with any external device (contactors) Furthermore, the making and breaking capacity of the circuit breaker must be adequate to the short-circuit current values of the installation. The capacitors shall normally function with an effective current value up to 130% of their rated current Icn (due to the possible presence of voltage harmonics in the network). a tolerance of +10% on the capacitance for banks up to 100 kvar and of 5% for banks exceeding 100 kvar is admitted (Amendment 1 of the above mentioned standards). For electronic trip units, by setting in OFF the instantaneous protection against short-circuit (I3 = OFF). For 150kvar/400v – 50Hz Capacitor, calculate the circuit breaker ratings? Select a 300A Circuit Breaker. For 20kvar/400v – 50Hz Harmonic Range with 7% Detuned Reactor. Calculate the circuit breaker ratings? 1- Nameplate kvar: Tolerance +15, –0%. 2- Discharge resistors: Capacitors rated at 600 V and less must reduce the charge to less than 50 V within 1 minute of de-energization. Capacitors rated above 600 V must reduce the charge within 5 minutes. (121% kvar), 15% capacitance tolerance and harmonic voltages over the fundamental frequency (60 Hz). 4- Dielectric strength test: Twice the rated AC voltage (or a DC voltage 4.3 times the AC rating for non-metallized systems). The NEC, Section 460.8(c)(3), requires the disconnecting means to be rated not less than 135% of the rated capacitor current (for 600 V and below). 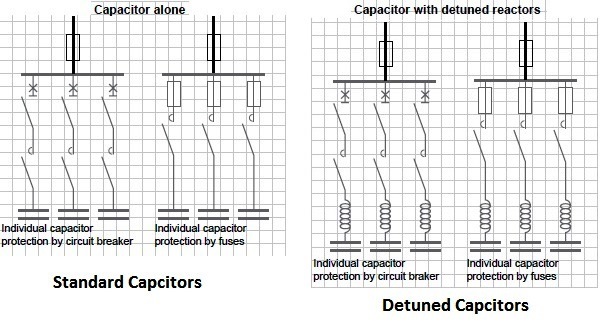 When capacitor is connected to the load side of the motor overcurrent protection, fused disconnects or breaker protection is not required. Fuses are recommended for all other indoor applications. Does not preclude NEC requirement for overcurrent protection in all three ungrounded conductors. Since power capacitors for industrial service are designed for use in an ambient temperature of 46°C (115°F) maximum, the cables and disconnecting devices should also be selected for this ambient operation. For detuned type equipment, see below table-3. When two steps are protected by the same set of fuses, the coefficient becomes 1.4 x In for standard. (Icn: sum of the currents of 2 steps). For 50 kvar / 400 V - 50 Hz – standard. Calculate the fuse rating? 50 kvar / 400 V - 50 Hz - DR (tuning 4.3). Calculate the fuse rating? It can sustain without damages the inrush current of the capacitors. The contactor must be protected against short-circuit by the protection device. 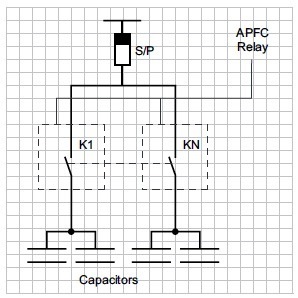 Capacitor duty contactors are recommended in APFC equipment to minimize inrush currents experienced during the switching of capacitors. These contactors have special early make contacts with series resistances which dampens the inrush currents. 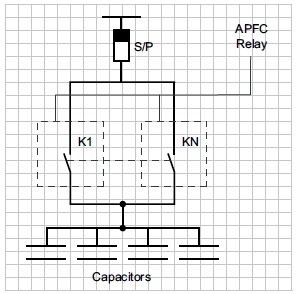 Capacitor duty contactors are rated based on nominal reactive power. Capacitor duty contactors are normally rated up to 60kvar. When higher rated steps exist such as 75kvar, 100kvar and above, the following methods can be adopted. 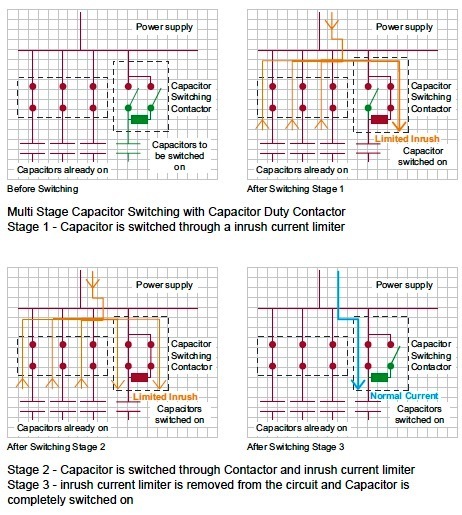 Capacitor Duty Contactors can be used in parallel to switch the Steps. In option B, if one contactor malfunctions, the other contactor gets over loaded and there is possibility for damage in second contactor also. However if both contactors are in good conditions and operate exactly at the same moment, theoretically there will be no problem. But the contactor switching may not occur exactly at the same time, and a very small time difference may cause over loading of contactors. Contactors of AC3 Duty can be used in this case but capacitors need to be put in series with inductor coil. At capacitor switching while one or more capacitors are connected to the system, the switching capacitor will see a high inrush current. This is due to the current flow from the already connected capacitor(s) (which will act as a source) through the least impedance path set by the switched capacitor along with the current from the main source. This means that when the number of capacitors in parallel increases, the amount of inrush current also increases. Inrush current will damage the capacitor as well as the switching device. In order to prevent inrush current, it is required to use current limiting devices such as Capacitor Duty Contactors or Inductor Coil. 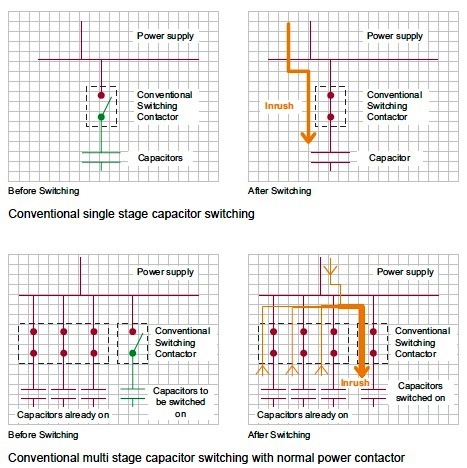 See fig.5 for the conventional single stage and multi stage capacitor switching and switching using normal power contactor and compare it with fig.6 when using a special capacitor duty contactor. When normal Power contactors are used, and when there are no reactors in series, a suitable inductor coil has to be connected in series with the contactor for limiting the inrush currents. Power contactors are rated based on the rated operational current. The rated voltage of the contactor shall be equal to or higher than the maximum network voltage with the power factor correction installation. The contactor shall be designed for continuous current (including harmonics) which can pass the power factor correction installation and/or filter at maximum source voltage, maximum frequency and extreme tolerances of the components, especially capacitors and reactors. Capacitor duty contactors are rated based on nominal reactive power and Power contactors are rated based on the rated operational current. In the next article, we will explain how to choose Capacitors, Resistors, PF Controllers and Cables for Power Factor Correction Capacitors Calculators. Please, keep following.